There\'s a map posted as soon as you turn off the road onto the trail. 3 or 4 shortish loops. Not well marked. It\'s a fun ride and close to Towson and Baltimore. Connect a few loops for a 30-45 minute ride. Somewhat strained vibe with others who use the park but it is designated multi-use (to \"protect\" the park, some areas have signs spraypainted on trees \"no bikes\" - one even says \"no dikes\"). Review: Unfortunately, the majority of the trails, and certainly the best trails are now off limits. It's a real shame for riders in the immediate area, but the remaining trails can still be fun. For the main area, you can park on the corner of seminary and Dulaney valley or where providence hits loch raven drive. There is also some sanctioned riding along merrimans road and over to jarretsville pike that is about 5 miles round trip. It's ok for a quick ride and you are unlikely to see other riders. Review: Most of this trail is just smooth peddling up and down the hills on the main fire trail. This would be between dulany valley rd and seminary, now cross over seminary and start heading towards the dams and this trail has a lot to offer. I normally start at dulany valley rd and seminary ave and ride all the was down to the dams, when you come out of the woods at providence and loch raven rd go right up the hill and the trail is on your left, about half way up the hill. Check out some video I have. http://youtu.be/bLKeXyhSkAM I like this trail, I ride it offen. It's a great work out. Review: Glen Ellen Trail is a wide "brush truck/ logging" style road. Mostly hard packed dirt with 4 water "crossings". 3 trees to go over and one to duck under. All can be done at speed. Not very technical in nature but a good fun and fast ride. A few steep climbs. Some soft mud areas were found and enjoyed. Well marked bike path with white metal strips on the trees, the single track is well marked to stay off of with bikes. Total distance was just over 8 miles with 700ft of climbing. I would rate this as intermediate just This would be a great Fat Bike ride in the snow!!!. Review: Great for a beginner to become an advanced rider. Review: I have not rode here since they closed the singletrack area. It was a real fun, counterclockwise day with great views and about 12 miles long. I heard all that is left is forest roads and double track. I could be wrong, I thought MORE was working on access issues. Review: Just remember to be courteous and share the trail with other users, and usually its a good fun ride. Tons of people always out riding the fire roads, very fast, relatively smooth, not too technical although there are some pyramids. Similar Trail: Robert E Lee. 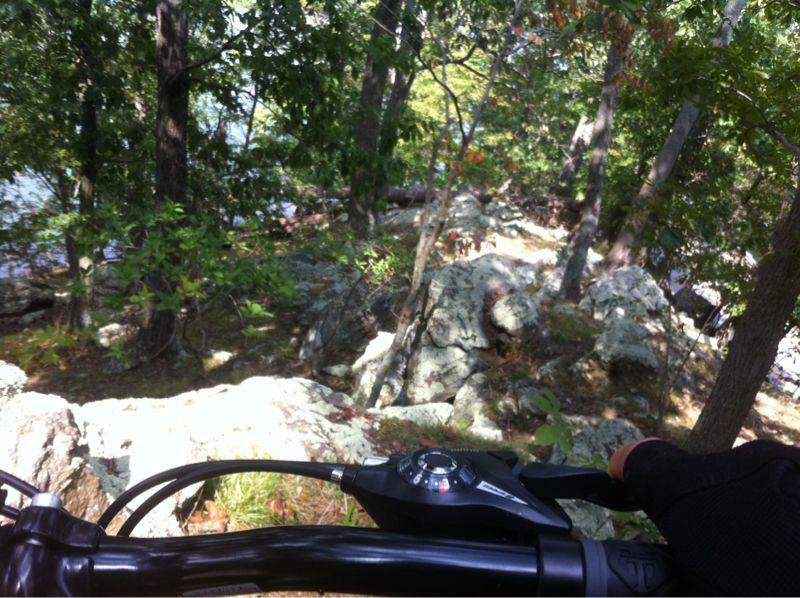 Loch Raven Reservoir MTB Trail 4.05 out of 5 based on 22 ratings. 22 user reviews.